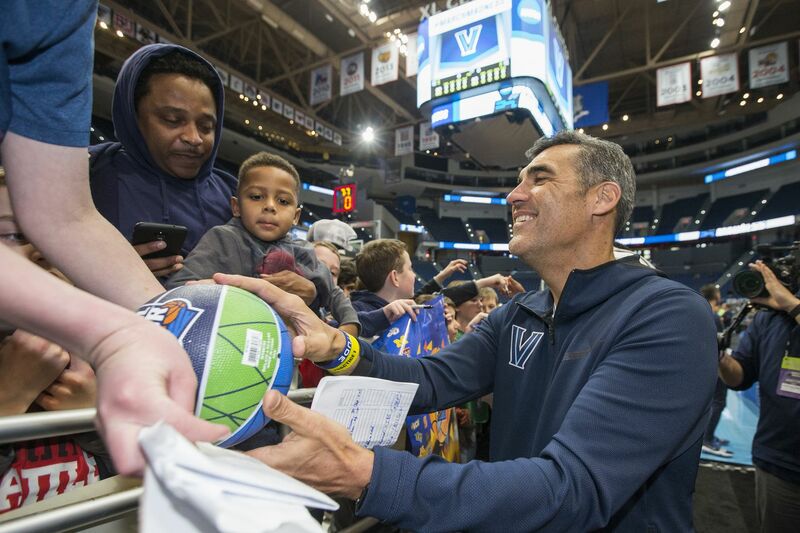 Coach Jay Wright, right, of Villanova signs autographs for a group of youths following their practice. Villanova ran through their public practice session at the XL Center in Hartford, CT on March 20, 2019 as they prepare for their game against St. Maryâ€™s in the NCAA Tournament. HARTFORD, Conn. – Now that Villanova’s young players have passed their first postseason test, they get an opportunity to climb an even larger stage in the NCAA Tournament and the added attention that is fixed on the defending national champion. The question is how well the seven freshmen and sophomores on the Wildcats (25-9) will handle the next level, the added media attention, the long bus ride from their hotel in suburban Glastonbury and the atmosphere inside the XL Center when they take on Saint Mary’s (22-11) in their first-round game Thursday night. Coach Jay Wright thinks they’ll be fine. “I thought as the [Big East] Tournament went on, we got better,” Wright said Wednesday. “I thought in the Seton Hall (championship) game, everybody looked really comfortable. I really think that environment, and that one-and-done feeling, can help them here in the NCAA Tournament. Some of the underclassmen played a role in the Wildcats’ Big East championship run. Sophomore Collin Gillespie scored 19 points in a quarterfinal win over Providence. Sophomore Jermaine Samuels had 17 points, 9 rebounds and 4 assists against Xavier. Freshman Saddiq Bey posted his second career double-double, 16 points and 10 rebounds, in the title game versus Seton Hall. Paschall and senior Phil Booth have led the Wildcats all season. Booth, the only player on the current roster who played in both the 2016 and 2018 national championship games, has 14 games of experience in the NCAAs. He likes what he has seen from his younger teammates. Coach Jay Wright huddles his team at the start of practice. Villanova ran through their public practice session at the XL Center in Hartford, CT on March 20, 2019 as they prepare for their game against St. Maryâ€™s in the NCAA Tournament. Saint Mary’s won the automatic bid from the West Coast Conference with a 60-47 upset of top-ranked Gonzaga. The Gaels play at a controlled pace, ranking 347th among the 352 Division I teams in adjusted tempo according to kenpom.com. They also guard the three-point shot well, allowing opponents to hit 31.8 percent of their attempts and an average of 5.4 threes per game. That could be a problem for the Wildcats, who average 10.6 threes and attempt 53.5 percent of their shots from the floor behind the arc.